The Raymer Society is pleased to announce that its semiannual consignment art auction will take place on Saturday, April 28, 2018 at 1:00 at the Trinity United Methodist Church, 224 South Main St, Lindsborg, Kansas. In the four years since the first auction was held, interest in this event has exploded nationwide among both sellers (consigners) and potential bidders, reflecting the fact that there is an interest in Lindsborg and regional art and it is found throughout the United States. To accommodate this high demand, the society will, again, hold two auctions this year instead of one. The Raymer Society Art auction will feature 6 original works by Lester Raymer, including oils, a watercolor, a small sketch and a linocut and Birger Sandzén, including 14 linocuts, woodcuts and lithographs. This auction also features over 160 fantastic works by Lindsborg and regionally and nationally known artists, as well as Prairie Print Makers. You can view all of the consigned art by visiting: lesterraymer.org. In addition, all the pieces will be on exhibition at the Red Barn Studio Museum, 212 S. Main, Lindsborg from April 10 to the April 26 during regular museum hours and by appointment. To make an appointment, call the Red Barn Studio at (785) 227-2217. You can preview the auction pieces on the day of the auction at the church from 11:00 until 1:00 when the live auction begins. Finally, a silent auction of approximately 30 works of art will be held at the church during the same time as the live auction. For bidding options and other information visit www.redbarnstudio.org. 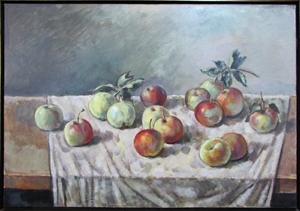 You can also bid online by clicking on the liveauctioneers.com link on the Raymer Society website, lesterraymer.org. Proceeds from the sale will go to support the mission of the Raymer Society: to preserve and promote the work and memory of Lester Raymer and to provide public opportunities for artistic and cultural enrichment. The Red Barn Studio Museum is open Tues through Fri 10AM to 5PM and Sat and Sun, 1PM to 5PM and by appt. Add Raymer Society Consighment Art Auction to your free online travel itinerary.